The modern day Disney classic Pirates of the Caribbean has headed back to the theaters in its fifth installment Pirates of the Caribbean: Dead Men Tell No Tales. I remember many years ago seeing the original Pirates of the Caribbean: The Curse of the Black Pearl in the theater. My husband and I were just engaged and we were out on a date night (ahh remember those days?) we were hooked and watched each of the sequels faithfully. 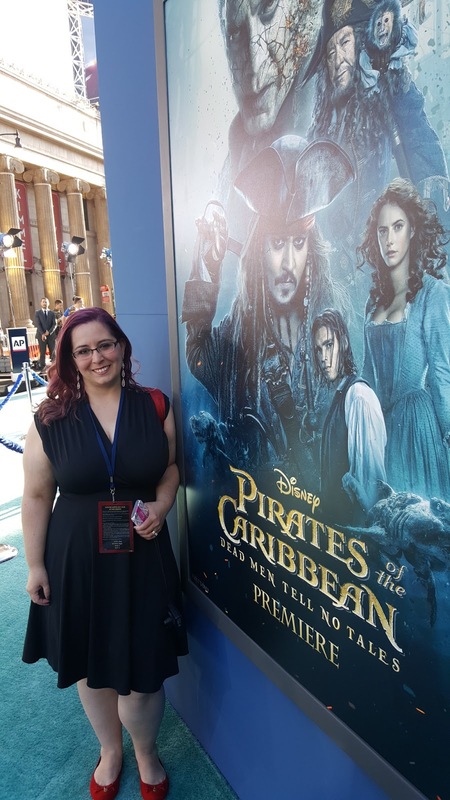 To think that I was on the red carpet for the premiere of a Pirates of the Caribbean movie?? It was a bit surreal like a dream, is this really going to happen, is this real? Oh yes, it is! I walked the carpet and attended the premiere at The Dolby Theater. Yes, this is the very theater where they host the Oscars! 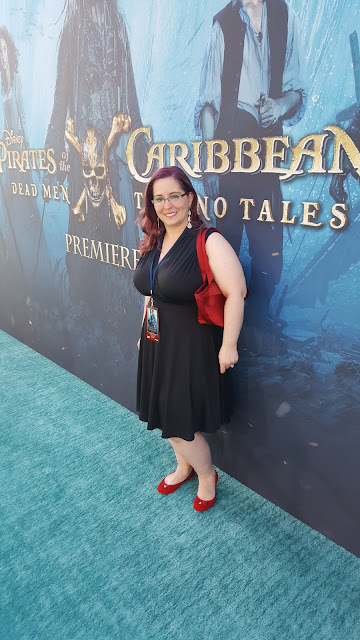 Come and check out what it was like to walk the red or in this case teal carpet at the premiere of Pirates of the Caribbean: Dead Men Tell No Tales! When you hit the carpet you feel a buzz of excitement from all of the people around you. From the fans (some dressed like they just voyaged across the seven seas themselves!) who have come to take a peek at the event, to the paparazzi, to the celebrities themselves. For this fantastic event, I had to have a fantastic dress, I went with a classic cocktail black dress. I wanted to be stylish and comfortable who wants to be uncomfortable while attending a wonderful event like this, comfort and style is key for me. In black, well of course, it the prime pirate color right? The dress looked great on the red carpet, very dressy and polished. Each red carpet event is different, and tis was no exception besides the fact that the carpet color was not red, it was teal, a beautiful ocean blue. There was fog and there were pirate fans dressed as pirates everywhere. There were even special places on the carpets for pirates! Yup, they were everywhere! There was a slightly ominous feel of the event, there was even fog being pumped out and I loved it! Well, we were dealing with ghostly pirates after all aren’t we? I was on the same carpet as A-list celebrities and Oscar winners, it was unbelievable this is something that can never get old, it is a unique experience each time and I cherish the fact that I get the chance to witness something like this. The carpet was jammed packed full of people, from the screaming and yelling fans to the guests themselves, there were plenty of people excited to see the movie. 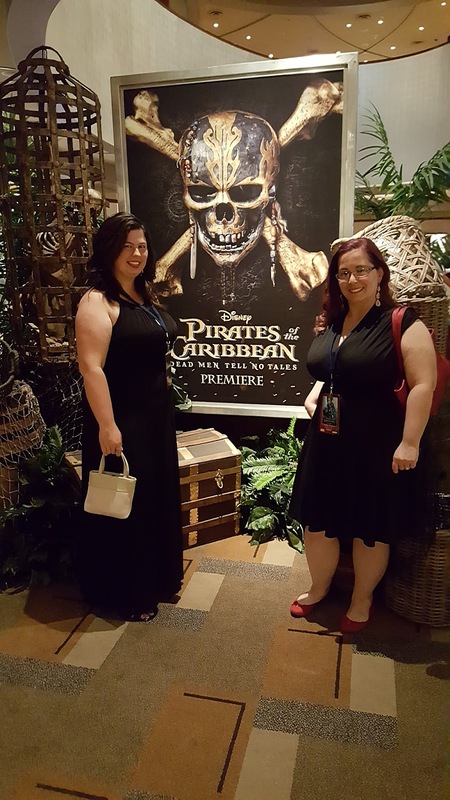 Right from one exciting experience to another, as soon as we walked the teal carpet were all invited to the pre-premiere party inside of the Dolby Theater. I have never been to a pre-premiere party, so this was a special treat. 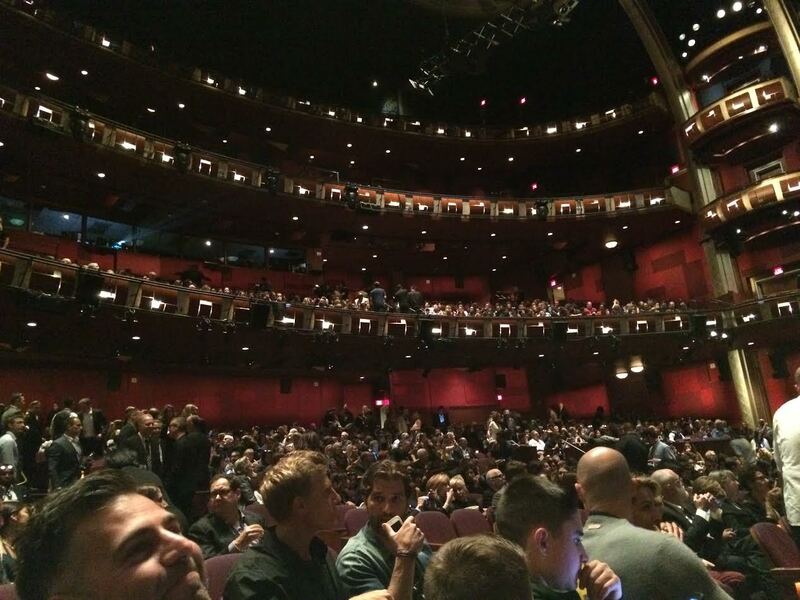 It was amazing inside of the theater, so polished and classy (I can see why they host the Oscars here). This was a great time for food drinks and more celebrity spotting. 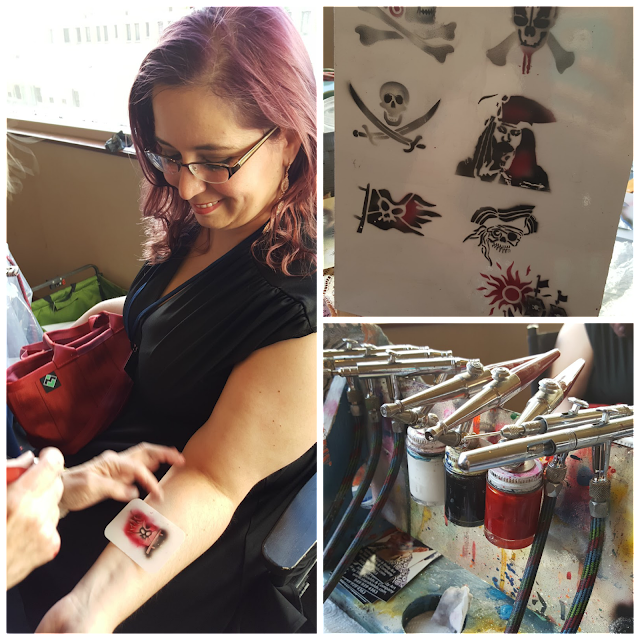 We were treated to makeup touch-ups from Lorac and even for fun pirate tattoos. 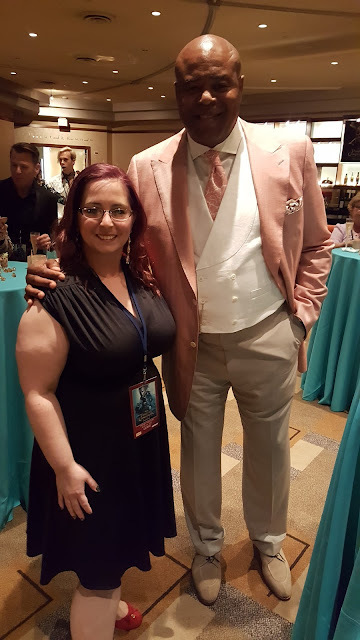 I hung out and had a great time with Crystal from Surviving A Teachers Salary, we had a fun time eating appetizers and enjoying all that was there to enjoy. 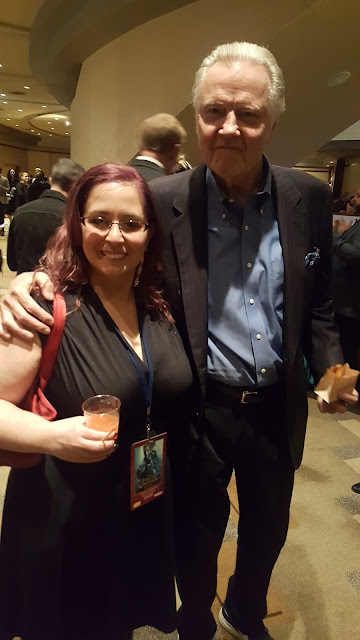 While on the look out for celebrities I ran across a few great ones including Chi McBride, from Hawaii-5.0 fame and the iconic and Jon Voigt, I am such a fan, it was so nice to meet them and they were both very sweet. 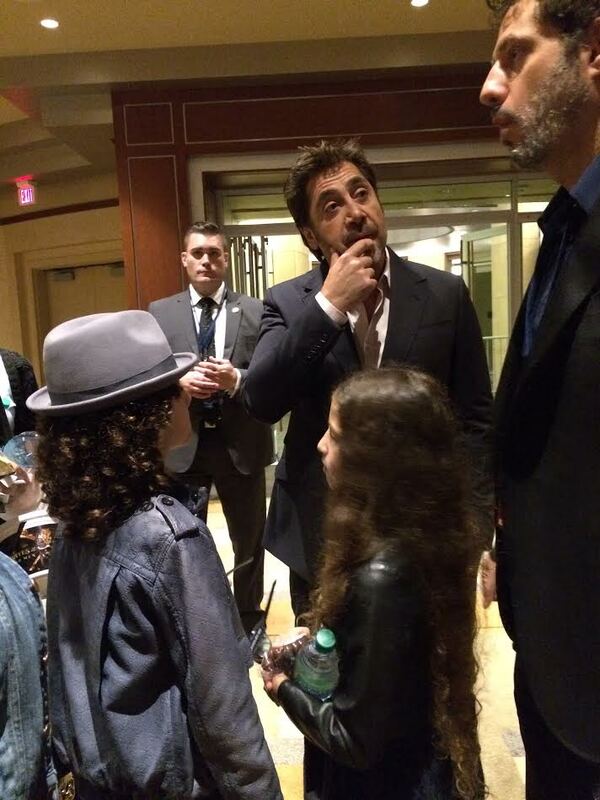 I even got to rub elbows with one of the stars of the movie Javier Bardem, that was pretty amazing! Soon it was time for the movie, and time to head to my seat. When I was in my seat at the theater, I imagined all of the celebrities that may have sat in that seat. It was pretty cool. I know I will be keeping a look out and stopping and pausing the next Oscars to see who sat in my seat for that event. It was finally time to see the movie I have been waiting for years to see Pirates of the Caribbean: Dead Men Tell No Tales! So how was the movie? Arrr you going to like it? (sorry I had to throw some pirate talk in there…) well, check out my Pirates of the Caribbean: Dead Men Tell No Tales review. Johnny Depp returns to the big screen as the iconic, swashbuckling anti-hero Jack Sparrow in the all-new “Pirates of the Caribbean: Dead Men Tell No Tales.” The rip-roaring adventure finds down-on-his-luck Captain Jack feeling the winds of ill-fortune blowing strongly his way when deadly ghost sailors, led by the terrifying Captain Salazar (Javier Bardem), escape from the Devil's Triangle bent on killing every pirate at sea—notably Jack. Jack's only hope of survival lies in the legendary Trident of Poseidon, but to find it he must forge an uneasy alliance with Carina Smyth (Kaya Scodelario), a brilliant and beautiful astronomer, and Henry (Brenton Thwaites), a headstrong young sailor in the Royal Navy. At the helm of the Dying Gull, his pitifully small and shabby ship, Captain Jack seeks not only to reverse his recent spate of ill fortune but to save his very life from the most formidable and malicious foe he has ever faced. 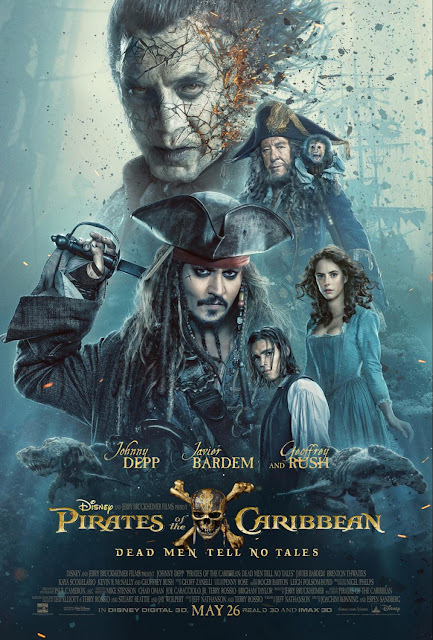 “Pirates of the Caribbean: Dead Men Tell No Tales” also stars Kevin R. McNally as Joshamee Gibbs, Golshifteh Farahani as the sea-witch Shansa, David Wenham as Scarfield, Stephen Graham as Scrum, and Geoffrey Rush as Captain Hector Barbossa. Joachim Rønning and Espen Sandberg are directing “Pirates of the Caribbean: Dead Men Tell No Tales” with Jerry Bruckheimer producing. 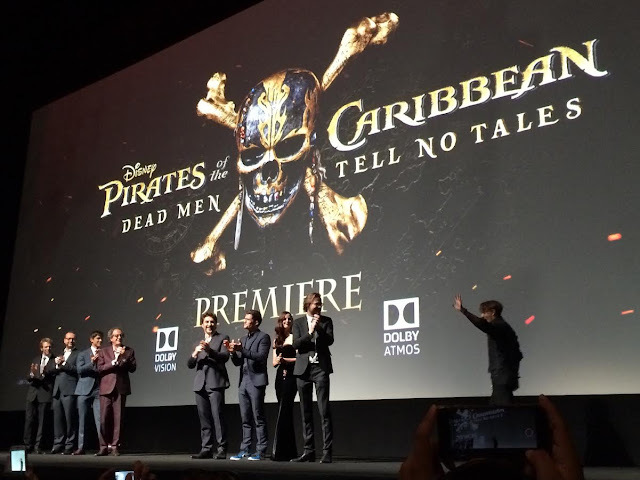 I will also have more information about the movie Pirates of the Caribbean: Dead Men Tell No Tales to share with you all soon, including interviews with the stars Javier Bardem, Geoffrey Rush, Brenton Thwaites & Kaya Scodelario. I will also have some great interviews to share from the people who made this movie come to life, the Directors Joachim Ronning & Espen Sandberg. Stay tuned for these amazing interviews as they will be posted soon. Will you be going to see Pirates of the Caribbean: Dead Men Tell No Tales? yes and my kids can not wait to see. Ahhh! What an amazing opportunity! I can't believe you got to hob knob with all those amazing actors. So cool. This pegs the cool meter. I've loved all the Pirates movies. The cast just keeps getting bigger and better for every movie. It's so awesome that you got to meet all those big name stars. Oh my gosh what a great opportunity. You must of had so much fun. Meeting also celebrities and watching a really good movie. I think I may have to pack myself in your bag the next time you do that. What a fun event! I love the Pirates of the Caribbean movies! What a fun event! I am super duper excited to see this movie!!! It looks like you had a blast at the event. Totally jealous of the "tattoos" as well, even if they are only temporary, smile. They really did make this a spectacular premiere. I love the costumed pirates and the pre-premiere party sounded like a good time. This is such a fun post! 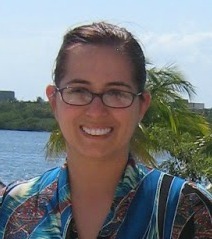 You are an incredible writer...I feel like I was there! (I wish I could have been there). SO fun! That looks like so much fun. My kids can't wait for the new Pirate's of the Caribbean to come out. What a fun experience! 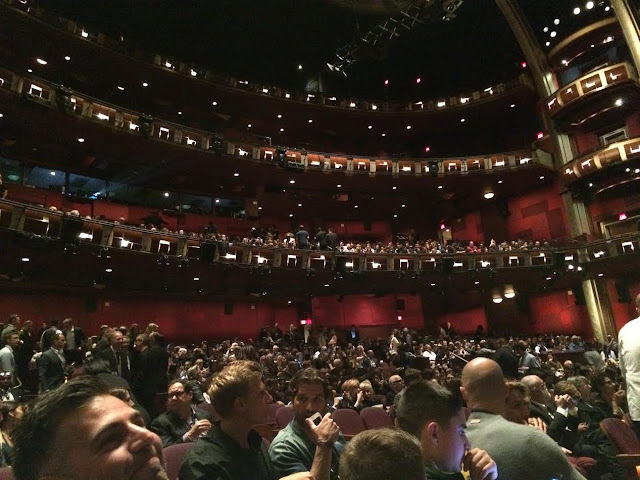 I've seen the Dolby theater before (never been in it) so I know exactly where you were! I can only imagine how busy it can get for premiers and the Oscars! I'm so glad that you had a great time, and I look forward to reading more about it. I look forward to reading your interviews. 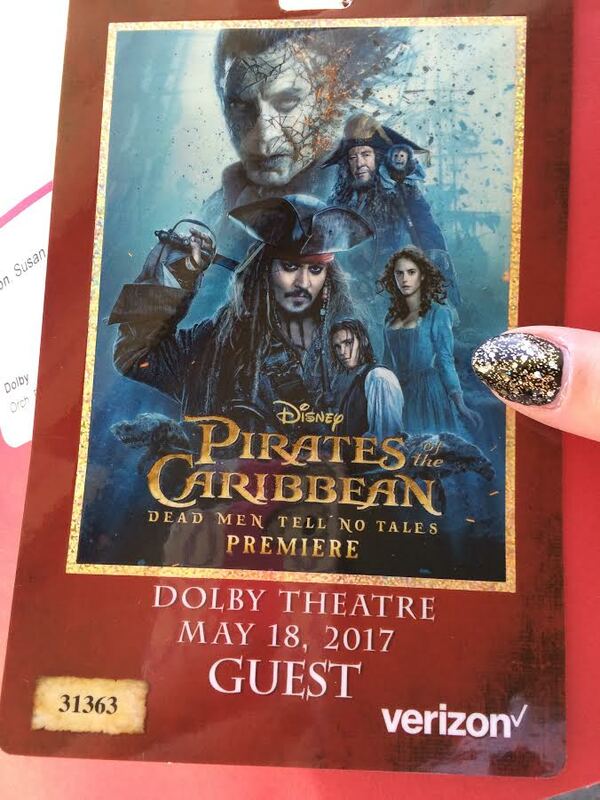 I am so excited to go see Pirates of the Caribbean: Dead Men Tell No Tales. I was so happy to find out they were making it. This was a great time! I love your pictures from the premier. It was great to meet all those stars! It looks like you had such a great time at the red carpet event. My family is really excited for this movie. We loved the other ones! I am looking forward to seeing this movie. I love Johnny Depp as Jack Sparrow. Wow! What an amazing opportunity to be on the red carpet! Looks like you had so much fun! I've been waiting to see this movie! 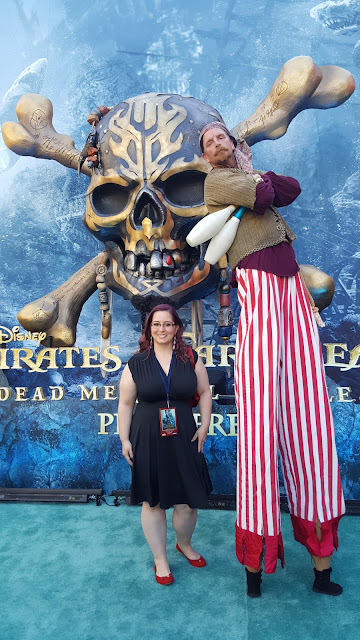 To just be on the red carpet for the premiere of a Pirates of the Caribbean would be exciting - congrautlations - and you met some great actors and rubbed elbow - plus looked great! What a memborable time! So, so fun! I would love to do a premiere sometime. I guess I'll settle for the recliner seats at our local theatre. Thanks for taking us with you in spirit!! This looks like it was so much fun to attend! I can't wait to see this movie.